(Gerry Furth-Sides) There are always people on your gift list that “have everything” or are so esoteric that they deserve an equally out-of-the box gift. 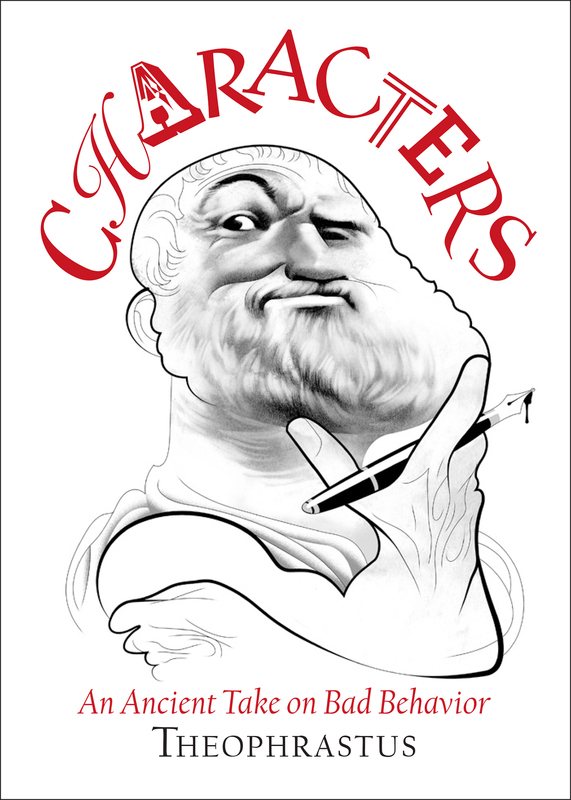 Theophrastus’ Characters: An Ancient Take on Bad Behavior is just that gift. I presented one to a precocious college student who majored in philosophy when he graduated at age 19, and a Greek intellectual friend who is always looking for something to read about that is Greek-related. I found that it works for a sun analysis of any kind of play, film or telenovela these days! This spec classical Greek text is newly translated for a modern audience, Theophrastus’ Characters is presents the full array of fault-finding. James Romm annotated the book. 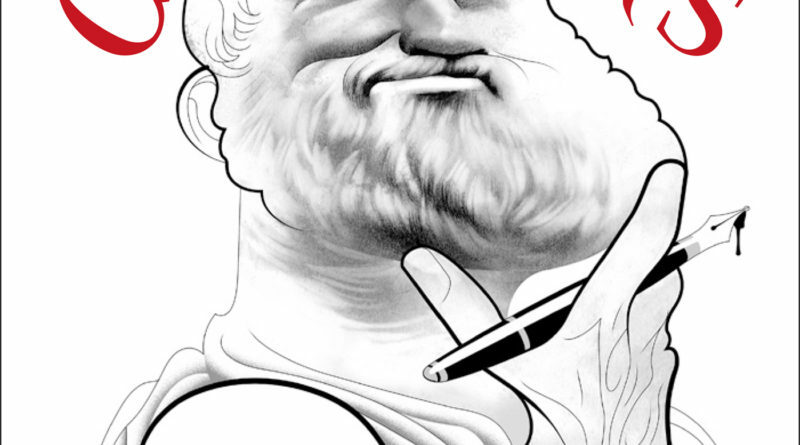 Illustrator André Carrilho brought it to life with his caricatures. It was translated by Pamela Mensch and Callaway Arts & Entertainment (October 1, 2018) is the publisher. 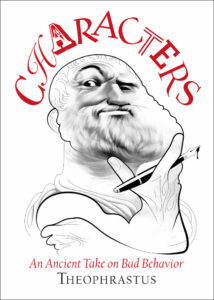 Aristotle noting that “comedy is about people we regard as worse than ourselves” perfectly describes this delightful book. In this version, James Romm outlines 30 characters, each crystallizing a human flaw we easily recognize. 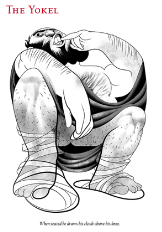 It is a humorous survey of failings, follies, and bad behavior taken straight off the streets of Athens and brought into our everyday fraught and divisive social and political scene. The human nature archetypes remain as insightful, caustic, and relevant today as 2,300 years ago. Top 5 list includes: The Talker—we all know one of these—is the sort who plumps himself down next to someone he doesn’t know and starts praising his own wife; he goes on to describe the dream he had the night before, and then relates in detail what he had for dinner. As the conversation proceeds, he remarks that people are much worse nowadays than they were in the past. And if you keep listening, he’ll never stop. THE SOCIAL CLIMBER: When invited to dinner, he is eager to sit next to his host. The type that comes forward in a splendid cloak and wreath, and says, “Men of Athens, my colleagues and I have sacrificed the Galaxia to the Mother of the Gods, and the signs are favorable. Accept your good fortune.” After he’s made this announcement, he goes home and tells his wife he’s achieved a stunning success. THE SLANDERER: He’s sure to join in when others are speaking ill of anyone, saying, “I’ve come to hate that man more than anyone.” When sitting in company, he’s apt to talk about someone who’s just left; and once started, he doesn’t stop until he’s maligned the man’s relatives. He’s especially given to speaking ill of his own friends and relatives (including the dead). THE SHAMELESS MAN: After shortchanging someone, goes back to ask him for a loan. When shopping he reminds the butcher of any favors he has done him. And then, standing next to the scale, he throws on some meat. James Romm is an author, reviewer, and the James H. Ottaway Jr. Professor of Classics at Bard College in Annadale, New York. His reviews and essays have appeared in the London Review of Books and The New York Times Book Review, among other publications. His books include The Edges of the Earth in Ancient Thought (Princeton University Press, 1992), Ghost on the Throne: The Death of Alexander the Great and the Bloody Fight for His Empire (Vintage, 2012), Dying Every Day: Seneca at the Court of Nero (Vintage, 2014), The Age of Caesar: Five Roman Lives (W. W. Norton, 2017), and How to Die: An Ancient Guide to the End of Life (Princeton University Press, January 2018) . André Carrilho is a designer, illustrator, caricaturist, and animator from Lisbon. He has shown his work in group and solo exhibitions in Brazil, China, France, Portugal, Spain, and the United States. His drawings have been published by Diário de Notícias, Harper’s, New York Magazine, the New York Times, the New Yorker, NZZ am Sonntag, and Vanity Fair, among others publications.